Discussion in 'vBench (Works in Progress)' started by KenBoyle, Aug 12, 2017. At age 71 28mm may be a stretch, but what the heck I've got a head mounted Optivisor ready to go. 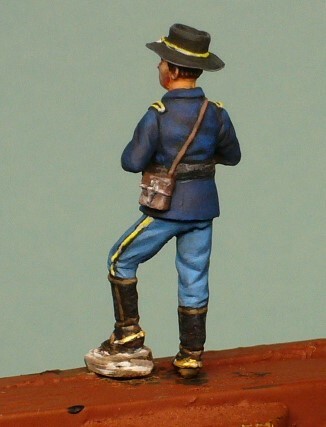 Since my favorite period is the American West of the 1800's, I couldn't resist Oniria's US Cavalry kit. It's a beautiful little grouping that's hard to resist. I've cleaned and primed the three figures without any changes. The proportions on all the figures including the horse are just right. On the horse I cut away the cast on reins as they were too bulky, and replaced them with new ones made from lead foil. More recent mounted figure kits from Oniria appear to come without cast on reins which, for me, makes things that much easier. Finally, I created the ground work for the figures, minus the vegetation, which I will add later. This is simply Magic Sculpt with pieces of slate and pebbles added. 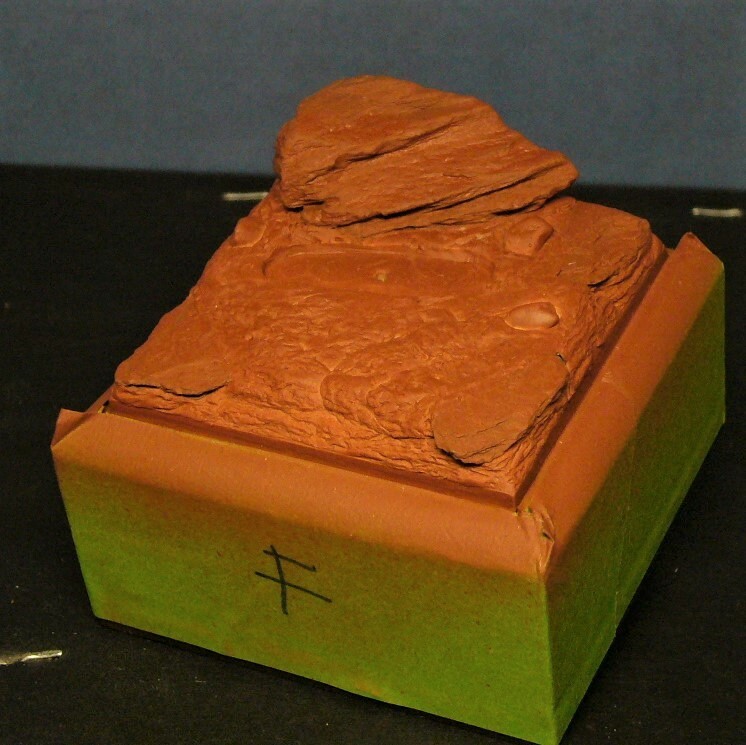 There is an indentation for the horse's cast on base, as I couldn't remove the base without damaging the legs. 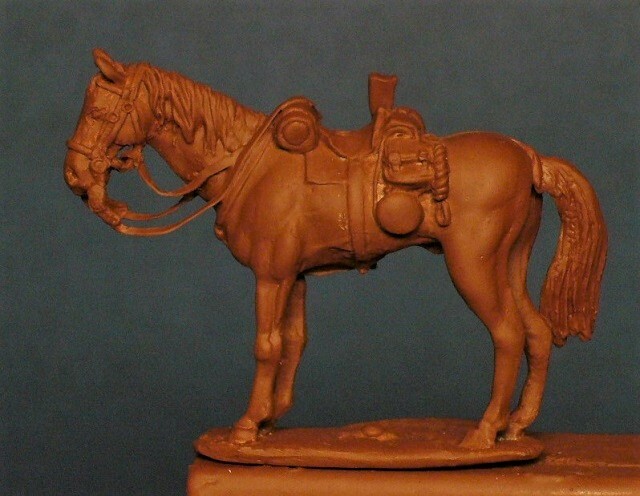 I will cover the outline of the horse's base with a little glued on dirt and vegetation afterwards. I wanted to be able to paint the majority of the ground work without the horse getting in the way. That's all for now. Wish me (and my eyes) luck. OldTaff, Fabricio_Fay, marco55 and 9 others like this. I have this set and the painter did a nice job.There are suppose to be more sets if this one sells well.Here's hoping. 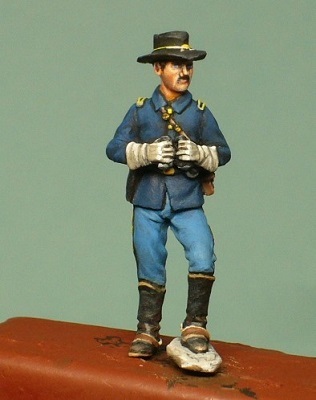 Here's a 28mm figure I have to get painted.Custer but in civil War uniform.I hope Oniria does him for their plains War range. Lasalle and KenBoyle like this. Is this a WIP figure from Oniria that they might release? It looks great. I have their "Wild Bunch" figures and love their "Desert Centaur" pair of mounted figures which are based on John Wayne and companion from "The Searchers". I wish they were available from someone in the states. The overseas postage and delivery can be a killer. I buy a lot from overseas miniatures vendors and individuals and have really not found the postage to be too far out of line. UK seems to be one of the worst but considering my stuff usually come by air (automatically) I find it reasonable. Just make sure that you aren't charged the VAT on any orders. 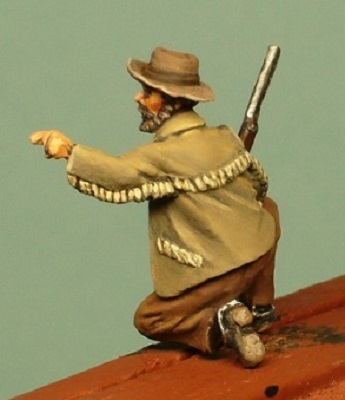 I have their Searchers vignette too.I think (hope) they will make some Comanches to go with it. 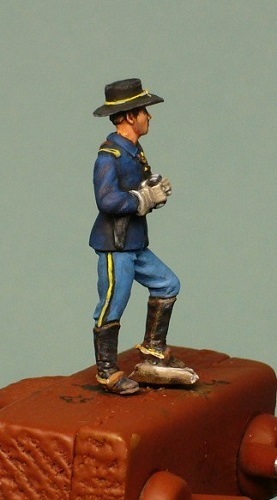 Well, the officer is done although I'm not happy with the boots/spurs. The sculpting is a little rough on the feet as compared to the rest of the figure. I probably should have used a file to clean up the spurs area a little before painting. However,I'll probably let it go at this point as the ground work vegetation will hide it somewhat if placed right. I can see doing a WIP instead of a COMPLETED figure thread has it's disadvantages. You get to see some of the sneaky stuff I try to get away with. But I guess that's part of what's good about viewing a WIP. On to the civilian scout next. 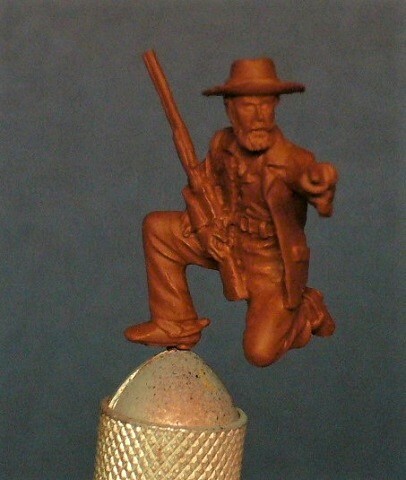 I'll tackle the mounted figure last. Right now I need to let my eyes uncross first. OldTaff, Viking Bob, phil_h and 3 others like this. 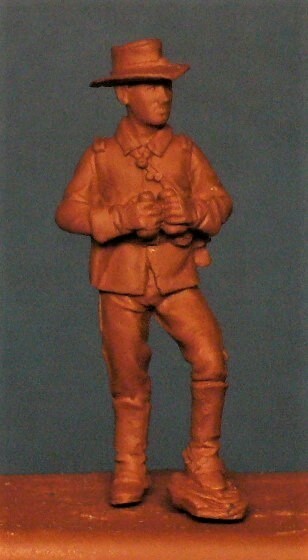 The Custer figure Mark has posted will be available separately shortly. I love that you are releasing collector's quality small dioramas / vignettes in 28mm (and 40mm). With space limitations an issue for me, doing the same stuff in 54mm or 75mm, as much as I would like them, becomes too much. And the subject matter is irresistible. 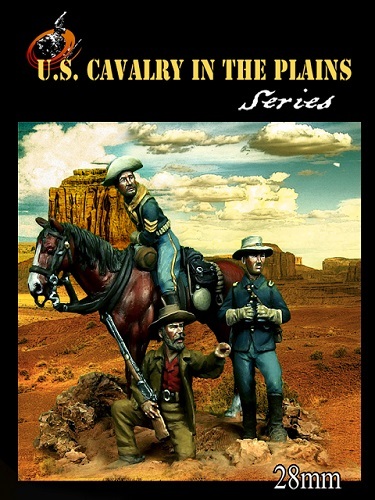 I'm looking forward to the Custer figure and any other old west/7th Cavalry items you release. 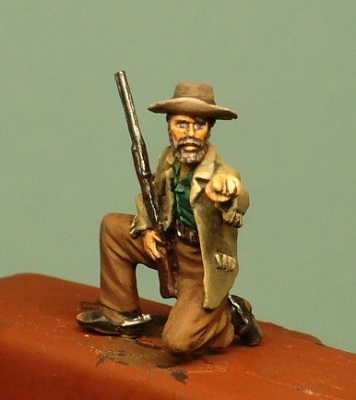 Between the Desert Centaurs, Custer and others, I may easily hit the free postage cost. oniria and marco55 like this. 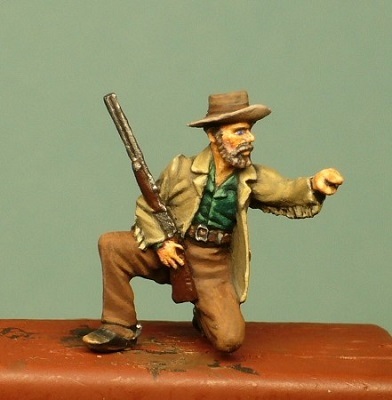 I am also looking forward to Plains Wars figures. Thanks Phil, comments much appreciated. I always seem to struggle with Blues for some reason. 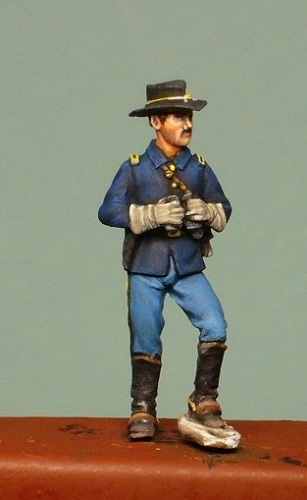 Since I love US cavalry figures in all scales, this can be a challenge. Ok, Ken's new personal rule. Never post a figure the minute it's completed at the end of a long day, and always take photographs, review, fix, take more photos, etc. prior to posting. 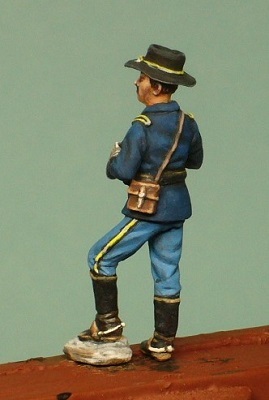 I just wasn't totally happy with the Officer figure after reviewing the photos I posted. Therefore, I touched up some items, especially the boots and spurs. The changes are subtle and I'm still not totally satisfied, but I've reached a point of diminishing returns. Again, the pitfalls of doing a WIP. OldTaff, Viking Bob and marco55 like this. Minor rant coming. I think the thing that is frustrating me a little with the 28mm figures is photographing them. I enjoy painting them but when they are blown up to 3 to 5 times their size in a photograph every little blending quirk is quite visible. I think I'm trying to be too much of a perfectionist (relative to my talent level) for this small a scale. 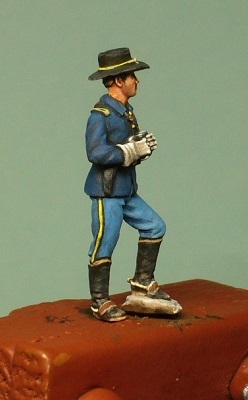 On a 54mm figure the minor blending issues are barely noticeable, if at all, in the photo. When I view the 28mm figure in person from 6 inches away they look much better than the photo. Ok, end of rant. Nevertheless , I am enjoying this and plan on doing others in this scale just for a change of pace. 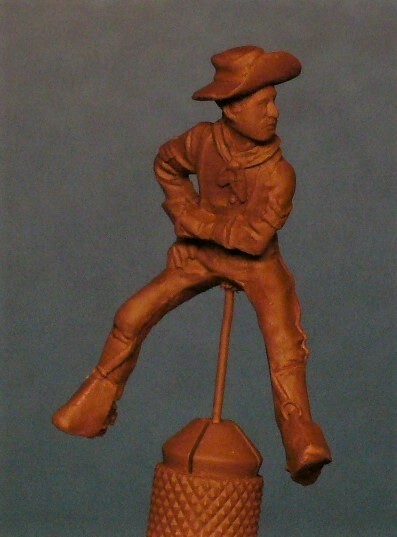 Moving on to the mounted figure. Horse first then cavalryman next. oniria, OldTaff and Viking Bob like this. 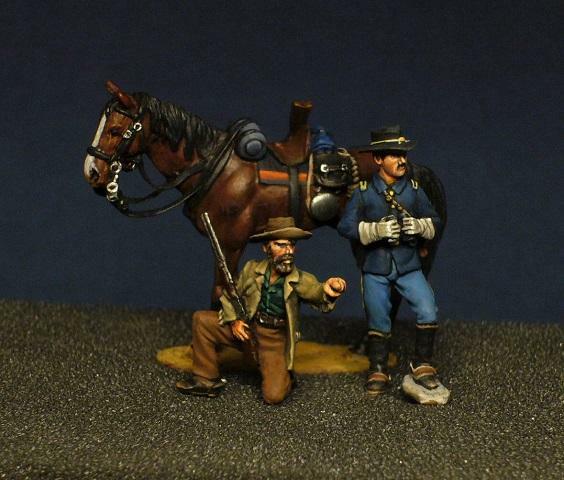 Horse has been completed and here is the vignette minus the mounted cavalryman and base/groundwork. I will work on hopefully finishing everything this weekend assuming no personal surprises pop up. oniria, Old Pete, OldTaff and 3 others like this.